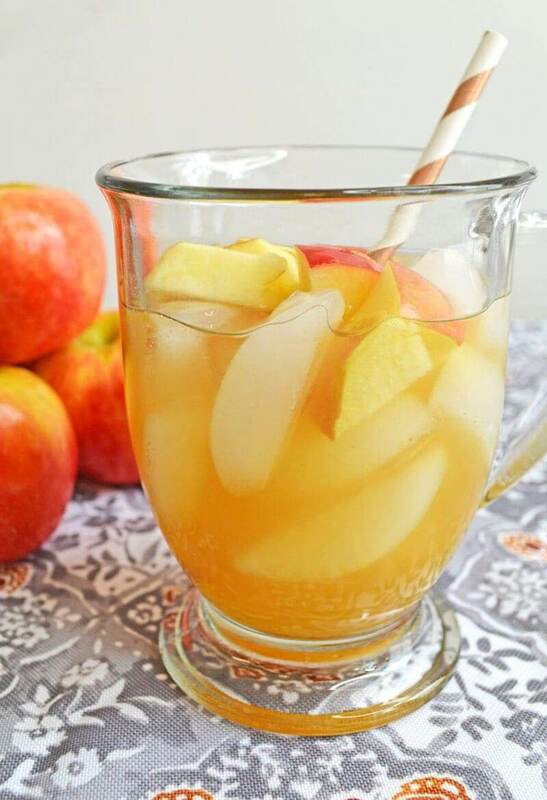 Is there anything more perfect to sip on to get you in the mood for fall than some delicious apple cider? Well, maybe some caramel apple sangria made with apple cider and wine. Apple cider on its own is so good, but when you add in some warmth from a creamy white wine and add some caramel vodka? Now we’re talking about fall! So many fall flavors! YUM! 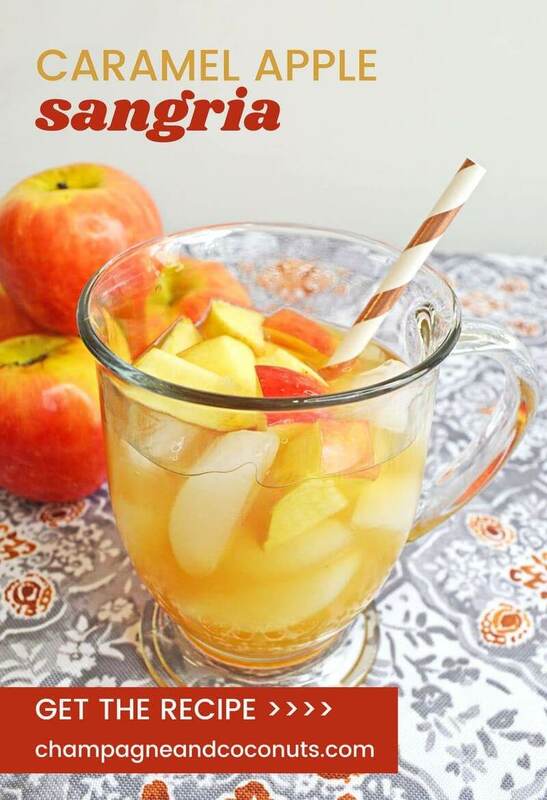 Caramel apple sangria is perfect to serve for your fall brunches and parties. It’s even great for a Halloween party or served at Thanksgiving. It’s the perfect, versatile fall go-to drink to have on rotation. Some people even call it apple pie sangria. 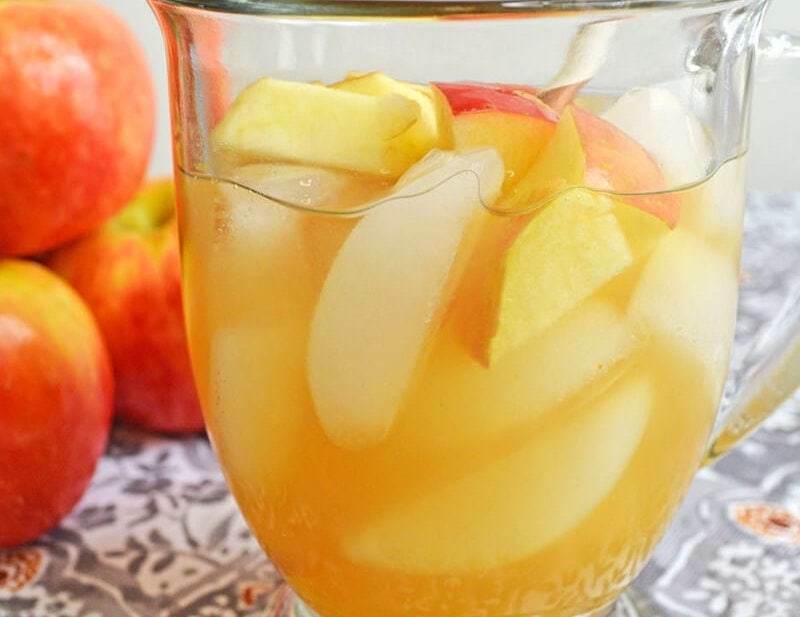 Caramel Apple Sangria, aka Apple Pie Sangria, is a versatile go-to drink to have on rotation for your fall events. Thankfully, this drink is so easy to make. That’s great because we all know that fall is super busy. School’s back in session, and people are starting to plan for the holidays. Don’t even get me started on football season. So making a drink that’s going to need a lot of crazy ingredients and skills may not be on the agenda. Making Caramel Apple Sangria into a mocktail will work. It will be more like a caramel apple punch instead. What you want to do is replace your bottle of wine with ginger ale. 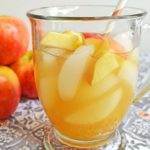 I like ginger ale in caramel apple punch as it has more flavor and warmth than substituting lemon-lime soda or club soda. If you really want to warm up the flavor, use some spicy ginger beer instead of ginger ale. That will really give it some kick and taste fantastic. Since you won’t be getting the caramel flavor from the vodka, you’ll want to substitute in 1 cup of caramel simple syrup. If you want to get fancy, there are some great Himalayan sea salt caramel syrups that are really good. 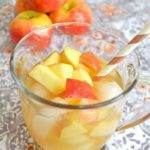 In a large pitcher, combine wine, vodka, and apple cider. Add 3-4 medium apples, chopped and cored. Muddle the sangria a bit to infuse some of the fresh apple flavor. Pour into a glass, over ice, and add additional chopped apples to each glass, if desired. You could also freeze a few of the chopped apples to reduce the need for ice! 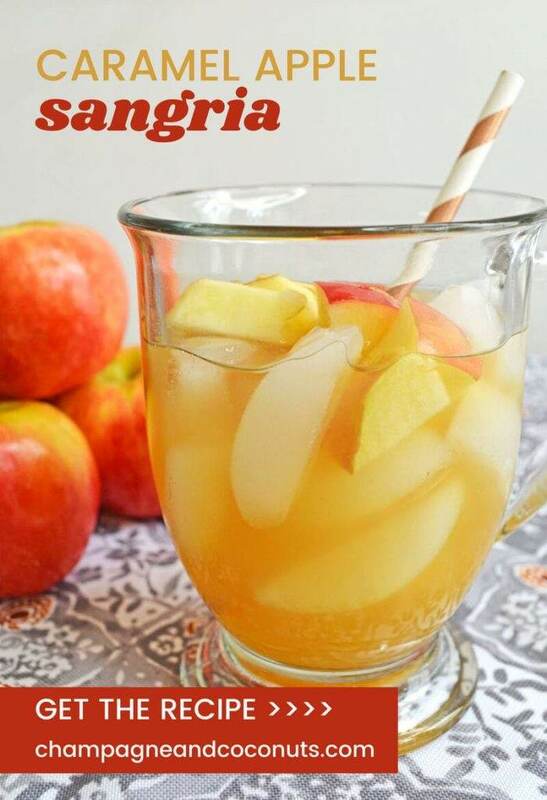 Caramel Apple Sangria is an easy to make fall sangria punch that tastes great for your get-togethers with family and friends. Some people like to call it Apple Pie Sangria too. Optional: add cinnamon or apple pie spice and stir. Optional: you may freeze a few of the chopped apples to reduce the need for ice! Please note that nutrition facts are subject to change based on your choice of ingredients and serving size. Please let us know how you enjoy our Sangria recipe. If you make it yourself, please let us know on Pinterest that you tried it and tag us with #champagneandcoconuts on your Instagram photo. If you haven’t had a chance to make it yet, be sure to save the recipe on Pinterest so you’ll remember where you found it. You may enjoy following our Sangria, and Fall Cocktails and Mocktails boards on Pinterest.